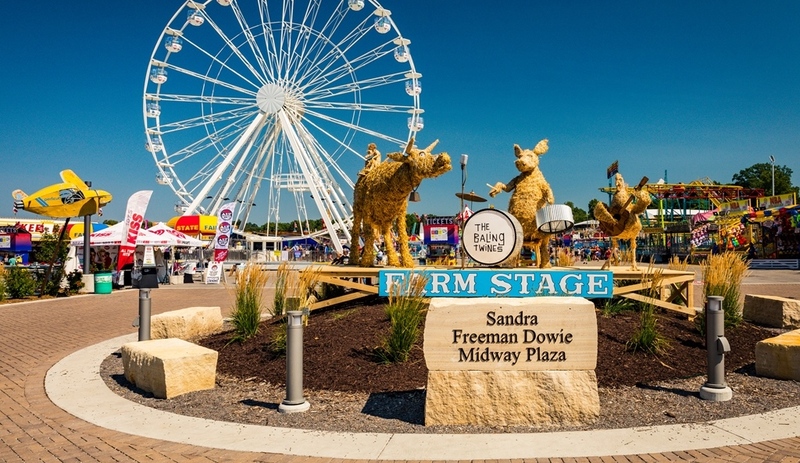 In 2017, the midway areas on the Farigrounds received a facelift and new names as a part of the Iowa State Fair Thrill Parks. Thrill Parks showcase three separate parks designed for different ages and levels of entertainment. To make space for the new addition to the Fairgrounds the pavement was expanded, utilities updated, and water/sewer lines extended. Pavers now form a walkway at the entrance of Thrill Ville. These permeable pavers help with rain water management. With the expanded midway footprint, the area is able to accommodate larger attractions. Thrill Ville offers a clean and family friendly atmosphere, but focuses on the jaw dropping, and super-speed screams of the best of today’s rides; it is located between the Grandstand and Ye Old Mill. Thrill Town features kid friendly rides and is located east of Gate 10 and directly north of the Richard O. Jacobson Exhibition Center Lawn. Lastly, Fairgoers seeking heart-stopping adventure will find it in the Thrill Zone which is located on the southwest corner of the Fairgrounds. In 2018, Sandra Freeman Dowie donated $1 million dollars to the Blue Ribbon Foundation, creating the Sandra Freeman Dowie Midway Plaza. When the area isn't filled with entertainment in August, this wide open space is used for various vehicle events as well as overflow parking during the off-season.